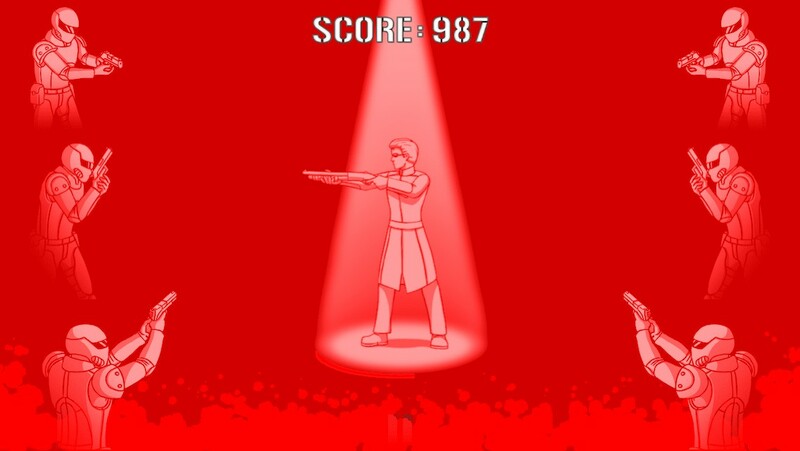 Take all the rapid gameplay of Fruit Ninja, add a Neo-Kung Fu theme, and you’ve got Gun Fu. It’s a reflex-pushing, ninja-shooting, action-packed series of minigames, and it’s not for the faint-hearted. There’s no story, and no sweeping setting. It’s just you, your guns, and a lot of angry ninjas coming your way. 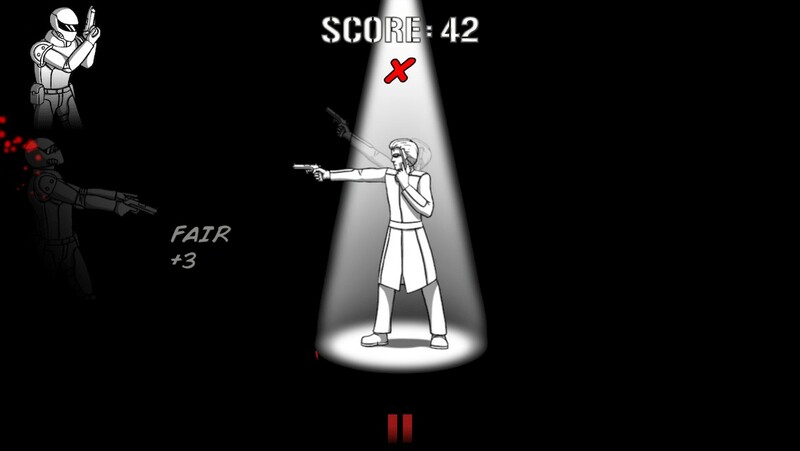 Gun Fu offers four modes to tap through, with each offering small variations from the basic gameplay. The core stuff remains static throughout all modes. Shoot the appearing enemies before they shoot you, and don’t miss too many times, or it’s game over. Your character’s two pistols allow for you to tap in two places at once for double shots, which are as satisfying to pull off as they sound. Oh yeah, and there’s no health. So one shot from any enemy means game over, you fail. It sounds brutally difficult, which at times it is, but the fun factor will keep you coming back. The first game mode, The 10 Trials, has waves of increasingly difficult enemies to survive through, as you try to rack up points for a high score. Here, you get three chances to miss, and a special bar called a “Fury Meter”. The Fury Meter increases with each scored kill. Then, when it fills up, you get a brief respite from the threat of death by grabbing a shotgun and gaining temporary invulnerability. Offering arcade-esque fun, 10 Trials works well. The second mode, Blitz, plays almost like a memory game, by presenting you with a series of numbers before each set of enemies appears. 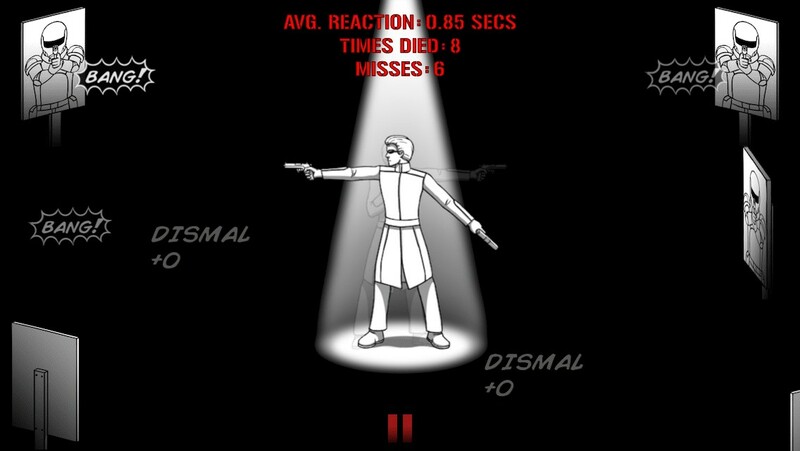 The numbers signify the order that the enemies must be shot, and failing to shoot the bad guys in order results in a miss (you get three misses in this mode). The patterns do become easy to remember, but that doesn’t ruin the mode since the enemies compensate by appearing and attacking quicker as the game progresses. Overall, it’s a neat tweak to the basic gameplay, and plays great. The third mode, Onslaught, makes the already simple gameplay even more so. You get your pistols, and five misses: that’s it. There’s no score for stylish kills, no special Fury meter to fill, and infinite enemies waiting to unleash hot lead on you. Your only objective is to kill as many of the oncoming horde as you can before they become too fast or too numerous to defend against. The uber-simple endless gameplay is awesome, making Onslaught as fun as any of the other modes. If you get worn out by the regular modes, you can try the less-punishing practice mode to bulk up your reflexes. This lets you practice any stage (that you’ve actually played to) from 10 Trials, and lets you try Onslaught mode on any difficulty. It replaces all enemies with cardboard cutouts, and it keeps a helpful tally of your average reaction time, your misses, and your deaths (if the enemies had weapons). This mode as a whole is sure to be a welcome break for some from the frantic main modes. The game is as tightly polished as it can be, with slick character animations, great gun sound effects, pulsing music, GameCenter leaderboard integration, and an awesome lack of (almost all) in-app-purchases. Overall, the game is furious fun, but I do have a couple minor complaints to mention before you tap on the App Store. The controls, while tight, can offer some frustration when it comes to double shots. Although horizontal double kills work great, the vertical (trying to shoot two enemies on the same side of the screen) double shots can lead to some weird finger positioning. While this isn’t a game breaker, it can be irritating in later levels of the 10 Trials when vertical double shots become a requirement. Also, there are ads. They only appear in between game sessions, though, and seeing as the app is free, this is barely anything to complain about. Gun Fu is a fast, brutal test of your reflexes. Overall, it’s just plain fun. If you like twitch games, head over to the App Store and hit install.